A bunch of drawings of Mondo Gecko, Mike’s radical reptile buddy from Ninja Turtles. I forgot to draw his elbow pads. Oh well. In the toy his skateboard also had an engine on it (you’d have to be ridiculously strong to not only stand on an engine powered skateboard and not be blown off, but do stunts on one, but it was a tubular idea anyway) but I thought it would get in the way of the picture, so I removed it. You have solved one of my childhood mysteries. I had an action figure of this guy I got from someone when I was little and I never knew who the hell he was XD. I love what you did with this one. The colors are just so right. From the graffiti down to the skateboard, you nailed it. I love mondo gecko! Great work! 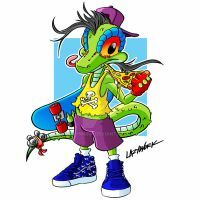 Hmmm I would have loved this guy as a kid if I knew about him since I loved Geckos back then lol. Other than that, great work with the colors along with these crazy and EXTREME poses! thanks. Yeah, I was a reptile fiend as a kid, so I loved him, along with many TMNT characters. One of the best things about the new TMNT series is that they're bringing light to these barely remembered characters from the old days. I faintly remember seeing the Mondo Gecko toy but I never remembered him in the cartoon. Great work on him, my good sir!!! Thanks. He was pretty popular among major TMNT fans back in the day, but was only in the cartoon about 2 times. My favorite thing about when they brought him back in the 2012 series is that he's voiced by the 1990 movie Mike voice actor. I agree, the new TMNT does a great job of representing all things TMNT from the past. Ha! The Mighty Mutanimals! I remember those guys. I never even knew of this guy until now. Always nice to learn something new. There were a lot of one off characters in TMNT. He was meant to be Michelangelo's best buddy but was only in about one or two episodes. He had an awesome toy back in the day, though, and appeared in the comics by Archie. They even brought him back in the modern reboot. Oh, Gex, the years have not been good to you. LOL. I guess he got sucked into the TV during the X Games.